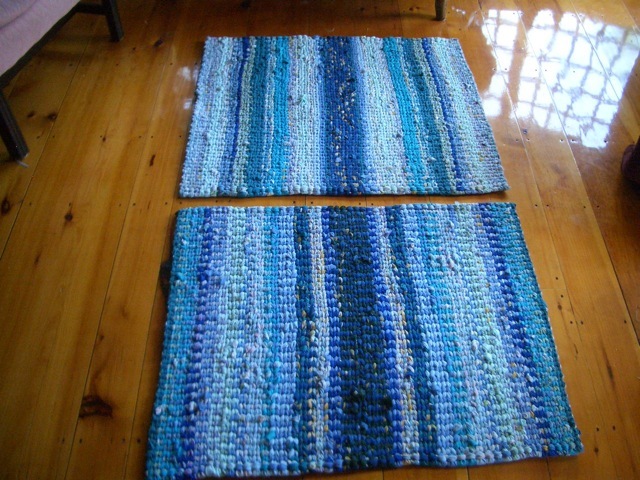 Friend Margaret Rauenhorst just made the two prettiest rag rugs I’ve seen yet. First, husband Ronald VanHeeswjik made her the hand-held loom–using the original stacked method, not the method that miters the corners which makes the loom totally flat and, we think, harder to handle. They figured a way to make a stand that allows Margaret to prop it over a radiator as she wanted to stand to make the rugs. Along the way, they made some other improvements in the loom and in the braiding that I think are really good. Margaret collected her fabrics from Good Will, The Salvation Army, and local quilting stores with fabric on sale. Just remember to choose fabrics that don’t ravel easily and that will wash and wear–that probably means cotton sheets, tablecloths, curtains, and the like. (And wash everything you bring into the house to prevent bedbugs.) Margaret divided her fabrics in half so that she could keep the rugs similar in color. The one on the left is made by banding the same colors; the one on the right is more of a herringbone pattern, where you keep switching colors when a color runs out. I love the clear colors Margaret has used–the rugs shimmer in the light. So pretty. And of course Margaret checked with the bride to see what colors she and her groom liked together before collecting her fabric. 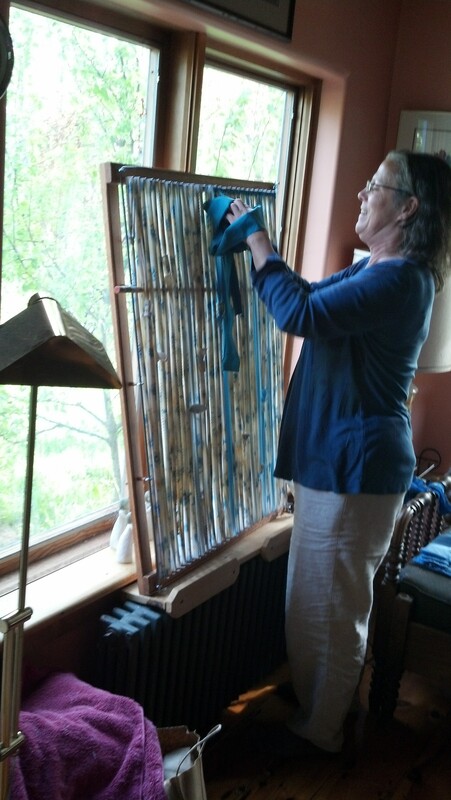 Here’s Margaret braiding/weaving on her loom. Note how she’s using a dowel to separate the background strands–I like that idea a lot. Here’s another improvement: the side bars slip up and down until you get enough tension on them–and can slip all the way out if you are not careful to grip them when you lift the loom. 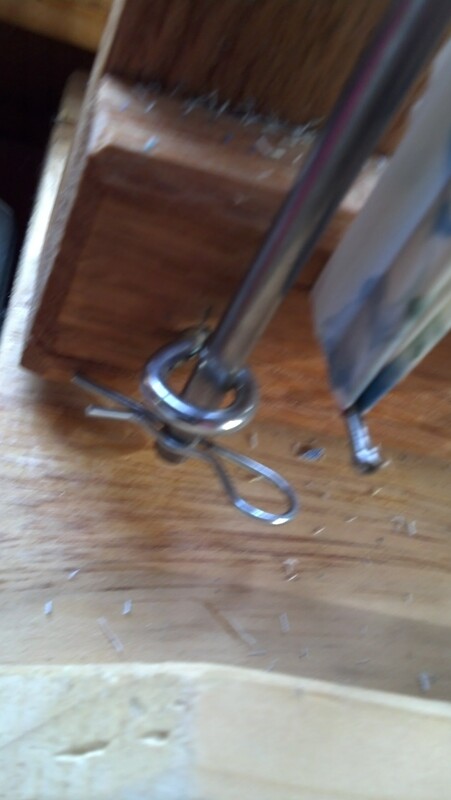 Ronald and Margaret solved this issue by drilling a hole in the bottom of each bar and attaching a clip that keeps the bar from sliding. 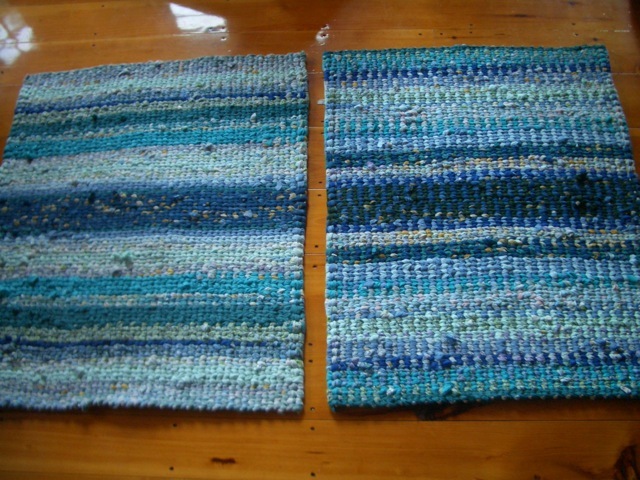 They’ve promised to drill mine when I finish with the rug that’s on the loom now–which will be a winter project for me maybe unless one of the kiddos or Tami gets interested. As part of the wedding gift, Margaret put together a little book of all the “sayings” she said ran through her head about healthy marriages and relationships as she stood and braided. She told me some of these one day when I went to see the first rug. I thought them wonderful–and still think she should maybe do something more formal with that book. (The bride loved it–how could she not?) Many of them speak to how lives get woven together as we live: the bride and groom, of course. But, also, Ronald, Margaret, and me as they took up this rag rug project. And, of course, all the lives woven together on this blog. I can pretty much bet that those two rugs will be with that bride and groom throughout their lives together. What a gift–on so many levels! Earlier entries on this blog give more information about a good rag-rug book and how to make the loom. It’s pretty basic. Didn’t they turn out beautiful. Love the book of sayings with the rugs. Margaret is such a special person.